I’ve discovered that my pole hobby doesn’t get along well with my toenail polish. And the girly-girl in me definitely does not appreciate that as soon as I hit the pole for class, some of the colour rubs off and leaves unsightly bare patches on the centre and tips of my toenails. I think it’s from the way I land in certain spins because it’s worst on the second, third, and big toe of my dominant right foot. What’s a girl to do? I’ve always loved my pedicures. God knows I’ve converted many a girlfriend into fellow mani-pedi addicts too. There’s just something about having your feet professionally primped and cleaned that I find incredibly soothing. And polished toe nails lend a stylish edge to any open-toed shoes… they even make old beat-up flip flops (which I wear often!) look much classier. 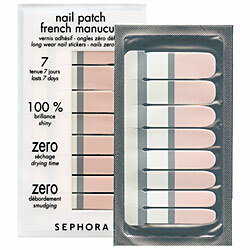 So I’ve found a solution to protect those pedicures: Sephora nail patches for hands and feet. They’re basically film-like stickers that come in lots of different shades including some funky neon colours. This season they even come in adorable floral and lace patterns, though I’m most partial to the classic French manicure style. Because they’re a layer of film over your nails, they act as a protective barrier against mishaps like chipping and breaking. So if you spot a small chip the corner of your nail, these little angels will prevent it from splitting off. How they work: You simply peel off a sticker in the appropriate size, press it firmly onto your nail, and peel away the excess. No fancy equipment needed as they only stick to nails, not skin. The coolest part is how the clean, neat edge along your cuticle makes them look super professionally done! You can apply clear varnish or any other regular nail polish colour on top of them to prolong their lifespan. I use these babies on my hands as well as my feet. Now I’m not saying that they totally withstand against the abuse I subject them to in class, but it sure beats chipping a fresh, day-old pedicure within minutes. So far they can last on my toes an average of 4 weeks with no holes in them. On the packaging, it says they last 11 days but even on my hands, they still last up to 3 weeks. I like to coat them with glitter after ten days or so to hide the nail growth along my cuticles when the difference becomes obvious. (It’s also a great excuse to express my inner Japanese kawaii schoolgirl) I sometimes even get gripped with an irrational temptation to buy them in bulk just in case Sephora stops making them. They cost far less than a conventional manicure or pedicure and last much longer without chipping. One pack is meant for either hands or feet and contains 14 stickers so you can afford to make a few mistakes, but because I’m a (very frugal) self-taught custom beauty specialist, I cut them in half by myself and can use one pack for both my hands and feet. Btw, I noticed in Allure that Sally Hansen makes similar nail stickers too, but I haven’t tried them as they don’t seem to be available here in Singapore yet. Having said all that, I’m currently kicking myself for being lazy last week and not using them!! !Because after vigorously thrashing around at my last pole class, I looked down at my foot and the top of my big-toe nail was hanging off half-broken. Luckily, it wasn’t too deep so it didn’t hurt. But the top of my toe’s all skin now and feels strange and naked. But try them for yourself and let me know how well they hold up! In the meantime, I’m going to have to wait until the top of my toe nail grows back before I can use them again. And having learnt my lesson, from now on I will use them religiously! This entry was posted in Mad Crushes and tagged pedicures, pole dancing, Sephora. Bookmark the permalink.